This is big job I did for a client that I have done lots of work with over the years. 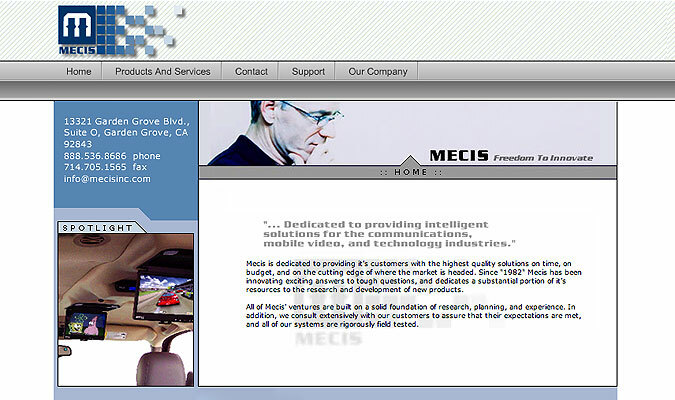 MECIS specializes in Mobile Video (flip-down TV's) but didn't have any web presence of their own to speak of. I had already done their corporate image (with all the accompanying collateral) so this project was relatively quick to roll out. Almost every component of this site was dynamic to facilitate quick maintenance, and the artwork was done at the end to flesh out the framework. I did all of the art direction for this site as well, which really opened my eyes to the power of a unified brand experience. I developed a series of badges and headers with photography of their products on location, but these didn't make the final cut. Luckily, I get the last word here, and they are included as the number 4 image above.